Herpes zoster (HZ), also known as shingles, is a painful clustered rash that develops along one or two dermatomes, and is most common on the face, trunk, or extremities. One of every three individuals in the United States who contract HZ is also at risk for developing post-herpetic neuralgia (PHN). The HZ incidence increases with age but typically affects people over the age of 60. Several studies have found that HZ affects the physical and mental well-being of already diseasestricken elderly. To prevent the occurrence of HZ and its complications, Centers for Disease Control and Prevention (CDC) recommended that individual over the age of 50 receive the recombinant zoster vaccine (RZV), Shingrix over the zoster vaccine live (ZVL) or Zostavax. This partly due to ZVL’s waning efficacy. As one way to increase vaccination rates among people 60 years and older, educational strategies were implemented to gauge HZ awareness and the willingness to receive the vaccine. The educational program was implemented at a senior center with 20 participants. Post survey results at that site showed 80% were very and somewhat likely to receive the vaccine. A pre and post survey study was conducted among 25 adults over the age of 60, in a Midwest urgent care clinic. The pre and post survey results suggest 100% awareness of HZ disease. Participants were very and somewhat likely to seek more information from their health care provider about the HZ vaccine, and likely to accept and schedule to receive the vaccine. Efficacy was one notable barrier and the participant’s readiness denoted “not now” because most participants came in with an acute illness. The survey suggests the importance of health care provider’s effort to improve vaccination rates through education. Each year, herpes zoster (HZ), commonly known as shingles, affects approximately 1 million people in the United States population . HZ is an acute illness resulting from the reactivation of the varicella virus or chicken pox that lies dormant on the dorsal horn nerve cells of the spinal cord . The disease typically affects one or two adjacent dermatomes, developing into a painful rash or cluster of fluid filled vesicles. Primary infection of varicella virus affects approximately 95% of adults in the United States (US) who therefore are at high risk of developing HZ . Regrettably, one of three people in the US will develop HZ in their lifetime . Postherpetic neuralgia (PHN) is the most common debilitating sequelae of HZ . One of five (1:5) people who develop HZ will suffer from PHN and unfortunately, the incidence increases with age . The Zoster Quality of Life (ZQOL) and the Zoster Brief Pain Inventory (ZBPI) tools were developed to determine pain measures and the interference of HZ with activities of daily living (ADL), and worsening quality of life on adults 60 and older [7,8]. The study by Gater et al. showed for certain that there was a correlation between pain and quality of life. Painful experience during the acute presentation of HZ significantly affected the physical and mental wellbeing of the people who suffer from the disease . The total annual medical cost burden of HZ in the United States was estimated at over 1 billion. A recent study conducted by Johnson et al. suggested that the total mean incremental healthcare cost annually among immunocompetent individuals with HZ was $1308 and $5463 when complicated with PHN . In addition, the subjects experienced over ten (10) claims of outpatient services or visits following diagnosis of HZ especially with patients afflicted with PHN. The risk for HZ can be reduced with HZ vaccination. A live-attenuated vaccine, Zostavax was approved by the US Food and Drug Administration (FDA) in 2006 for adults over 60 years . Then in 2011, FDA approved Zostavax for the 50 years and older population. The 2014 immunization guidelines indicate that the HZ vaccine should be limited to adults 60 years and older. Recently the FDA approved a recombinant, adjuvanted zoster vaccine, Shingrix, in October 2017. This vaccine promises better coverage in preventing HZ. Many adults 60 years old and older, lack understanding of the seriousness of HZ or the preventative nature of vaccination. The lack of knowledge and awareness of HZ risks, complications, treatment or prevention contributes to low vaccination rates among older populations [10-12]. Multiple sources support the need for expanding public education and increasing healthcare provider’s recommendations to increase the HZ vaccination rate. The purpose of this project is to develop and implement educational strategies to increase vaccination rates among the 60 years or older population. Herpes zoster virus causes clustered skin lesions on an erythematous base along the unilateral dermatomal distribution . Childhood chickenpox caused by the varicella-zoster virus remains latent inside the sensory axons to dorsal root ganglia . The unilateral lesion distribution is very common along the dermatome of the trunk or face . Immunosuppression is thought to be the cause of the reactivation of the virus during the aging process . HZ pain usually precedes the vesicular eruption by 48 hours or more and may persist after the disappearance of lesions. The affected dermatomes usually heal within 3-4 weeks. Herpes zoster manifests in three phases: prodromal (prior to rash eruption), acute or active (presentation of rash), and chronic (post-herpetic neuralgia) . For these different phases, the most common characteristic is pain. The pain from the rash is characterized as constant or intermittent burning, stabbing, tingling, deep aching, shooting, throbbing, and numbness [2,13]. This moderate to severe pain disturbs sleep, affects physical function, and can render the person incapacitated and reclusive. When the pain does not resolve in a few weeks, post herpetic neuralgia occurs. The major goals for management of the acute stage are pain relief and early intervention with antiviral medications to reduce the impact of HZ complications . The zoster vaccine live (ZVL), Zostavax was developed in 2006 for prevention of painful herpetic lesions and associated complications in individuals age 50 years and older . Zostavax vaccine has been licensed in various countries since May 2006 . The initial compliance for vaccination with ZVL in 2007 was very low at 1.9% of 3662 respondents. Of that group, only 27% were aware of the vaccine . Almost a decade later, Williams et al. (2015) reported that 24.2% of adults 60 years and older received the ZVL, 20.1% increase in 2012, but lagging six percentage points below the Healthy People 2020 targets at 30% . Several studies reported that obstacles to vaccination can be attributed to low perceived risk of getting HZ, vaccine side effects, high cost, lack of public education, and lack of provider’s recommendation [21-23]. Lee et al. suggested that the use of media has the greatest influence on patients who received the HZ vaccine . However, even with increased providers’ efforts to improve vaccination rates, financial burden and reimbursement issues continued to act as barriers to vaccination [20,24]. The HZ vaccine is covered under Medicare Part D . For patients not covered by health insurance the costs of HZ vaccine typically range from $200.00 to $250.00 [26,27]. Despite the severity of the HZ disease, there is a lack of education to increase awareness among the 60 years and older population. The development of educational strategies has the potential to improve HZ disease awareness, reduce incidence, and prevent severity of complications among the older population through vaccination. A meta-analysis conducted by Gagliardi et al. evaluated the effectiveness and safety of vaccination for preventing herpes zoster in immunocompetent Caucasian older adults (mean age 60 years and older) and found that the vaccine is well tolerated, produces few adverse effects, and protects for up to three years . Reeves and Beuscher emphasized the importance of increasing awareness through patient education, which should be a significant part of the treatment plan, thus, increases patient satisfaction . The burden of herpes zoster disease among the 60 years and older population can be debilitating, especially when coupled with disability from other common age-related illnesses . The negative effects of the disease can impair physical functioning from either acute or chronic HZ pain. Interference with activities of daily living (ADL) and quality of life has been identified by several researchers [8,16,30]. Both Zoster Brief Pain Inventory (ZBPI) and Zoster Quality of Life (ZQOL) were created to quantify the impact of the disease in United States and United Kingdom. Decreasing the rates of the HZ disease and associated complications requires a multi-faceted approach, including awareness through education. The development of educational strategies geared towards the 60 years and older population must include, the pathophysiology of the HZ disease, risks, complications, treatments, and prevention . Even with media and internet production to increase awareness of the herpes zoster, the buy-in on prevention through vaccination remains at less than 25% . The face-to-face educational approach offers older individuals the opportunity to address individual concerns regarding herpes zoster or associated complications. Participation in face-to-face educational sessions may result in increased HZ knowledge and improved vaccination rates. The purpose of this project is to explore whether or not the use of educational strategies provided within the clinic setting for the 60 years and older population would improve herpes zoster awareness and increase HZ vaccination rates. In addition, an opportunity to provide education at a senior center in the local community was conducted to increase the basic knowledge about shingles in the community. The literature supports the intervention to prevent the occurrence of the painful and debilitating lesions of herpes zoster and the chronic complication of PHN. The conceptual framework of the Health Belief Model (HBM) was selected as the theoretical base for the DNP project. When people age 60 and older, are able to perceive their own susceptibility and recognize the serious consequences of HZ (including postherpetic neuralgia and herpes zoster ophthalmicus), they will be able to make informed choices about receiving the herpes zoster vaccine. Individuals’ likelihood for getting the vaccination might be greater if they have already experienced HZ or witnessed the suffering of a close family members or friends who were inflicted with the disease. 1. Identification and management of barriers and facilitators to vaccination among adults age 60 years and older. 2. Evaluation of the effectiveness of the educational strategies through the use of post questionnaire survey or the acceptance or receipt of the HZ vaccine. 3. Integration of educational strategies into regular clinic visits using written tools, such as brochures or pamphlet. 4. Collaboration with Clinic owner and GlaxoSmithKline (GSK) Biologicals, to determine feasibility of providing Shingrix vaccine supply for the clinic. 5. Collaboration with Information Technology (IT) department to create a pop-up reminder or integrate a checkbox in electronic medical record (EMR). 1. Non-vaccinated adults 60 years and older: Those persons who had or had not have herpes zoster disease and have not received the vaccination. 2. Herpes zoster: Commonly known as shingles, appears as painful clustered lesions with erythematous base common along the unilateral dermatomal distribution of the trunk and face. 3. Post herpetic neuralgia: The operational definition of PHN, as occurring 90 days or more after rash onset, and indicating high correlations with severity-duration measures of ADL interference and worsening quality of life . 4. Herpes zoster vaccines: The zoster vaccine live (ZVL) or Zostavax, is a live attenuated vaccine approved by the US Food and Drug Administration in 2006. Thereafter, a recombinant zoster vaccine (RZV) or Shingrix was approved in October 2017. Shingrix is a lyophilized recombinant varicella zoster virus surface glycoprotein E antigen component . This vaccine was recommended to be administered routinely to all adults 50 years and older. A person’s decision to engage in any health promotion behaviors are influenced by multiple psychological and cultural factor including attitudes, beliefs or perceived risk, and intention . These decisions are guided by many theories of health behavior. The inclusion of Health Belief Model (HBM) is used as the theoretical framework guiding this project. The Health Belief Model framework is a useful guide for this project to identify how individuals think and take certain healthful actions if given adequate information and education about HZ. The HBM model includes four different concepts: perceived susceptibility, perceived severity, perceived benefits, and perceived barriers. This model proposes that, a behavior depends on how much an individual value the importance of a goal . If the goal is to avoid a health problem, such as getting the painful herpes zoster, the individual’s vulnerability (perceived susceptibility) to this problem is judged to be potentially serious (perceived severity), thus, the individual must act to reduce the health threat (perceived benefit) and any overwhelming obstacles will not deter the action (perceived barriers). A new variable recently added is “cues to action.” This triggers the individual to seek the fulfillment of health behavior due to external cues, including media campaigns or learning about a friend afflicted by the health problem . The different perceptions including cues to action would hopefully lead the 60 years and older population to realize the necessity of receiving the vaccine (Figure 1). 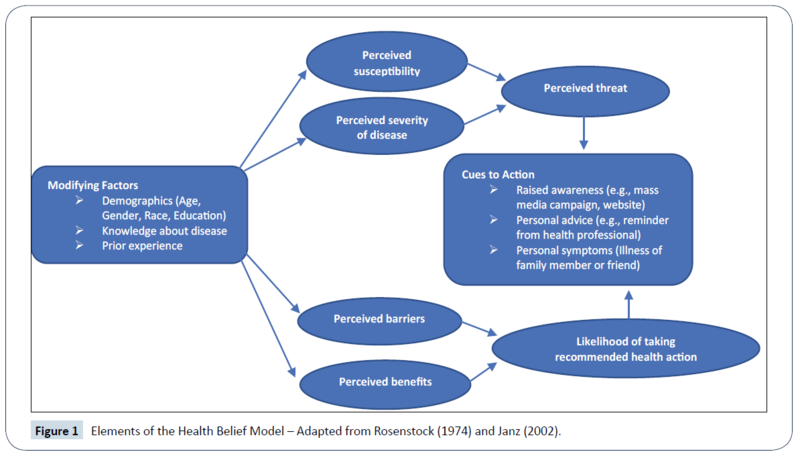 Figure 1: Elements of the Health Belief Model – Adapted from Rosenstock (1974) and Janz (2002). Many who are 60 years and older select health behaviors based on their individual perceptions about susceptibility and their understanding of the severity of HZ associated pain. In addition, behaviors are driven by their beliefs about the positive benefits from treatment or prevention activities such as vaccination. Further, individuals need to determine that decision to get immunized will be based on outweighing the risks and barriers that interfere with their action . In the HBM model, the primary motivation to change is the level of perceived threat or risk of herpes zoster, and the primary resource for change is self-efficacy or confidence to make the decision to get the HZ vaccine. Older adults should be encouraged to increase their level of confidence to receive the HZ vaccine. Providing education should be a goal to ensure their understanding of the seriousness of the HZ pain and the PHN as a chronic complication. The purpose of this project using the HBM is to assess the relative efficacy of educational strategies. The utilization of HBM construct, with people 60 years and older will focus on, increasing individuals’ the perceived susceptibility and recognition of the seriousness of the consequences (including post-herpetic neuralgia and herpes zoster ophthalmicus). Doing so will hopefully move them forward, receiving the herpes zoster vaccine. Based on the HBM, if people experienced or knew close family members or friends inflicted with the disease and saw firsthand the devastating effects, the likelihood of getting the vaccine is greater. The PICO question that guided the review of the literature was: In the population of 60 years and older, does the use of educational strategies on the benefits of receiving the Herpes Zoster/Shingles vaccine increase awareness and likelihood to get vaccinated compared to those not receiving any educational strategies? Multiple databases from the Southern Illinois University of Edwardsville (SIUE) library were searched using the following search engines: Cumulative Index to Nursing & Allied Health [CINAHL] Plus with Full Text, Medical Literature Analysis and Retrieval System Online [MEDLINE], Cochrane Database of Systematic Reviews, PsycINFO, PubMed, and DynaMed. Other website including Turning Research into Practice (TRIP) and National Guideline Clearinghouse databases were reviewed. The following keywords were searched in this review: “herpes zoster,” “varicella zoster,” “shingles,” “herpes zoster vaccination,” “education,” and “awareness.” Following the review of literature, the common themes identified include, HZ awareness, HZ complications, HZ vaccine, barriers to vaccination, and vaccination guidelines or recommendation. Several topics were reviewed to learn the state of the science for herpes zoster in the urgent care setting. A review of literature reveals the key areas as herpes zoster awareness, most common HZ complications, herpes zoster vaccine intake, attitudes and barriers to adults 60 years and older seeking vaccination, and vaccination recommendations or guidelines. Shingles manifests as clustered painful skin lesions along the dermatomal distribution on the face and trunk. HZ is frequently seen in patients 50 years and older, immunocompromised or immunosuppressed individuals . The reactivation of the latent childhood chickenpox virus can cause chronic and debilitating PHN. Complications associated with HZ increases with age and occur in almost half of all elderly patients or one of five diagnosed with the disease . The HZ associated pain unfortunately can last months or even years and there is a lack of universally accepted treatment of PHN [11,19,22]. Approximately 1 million new cases each year in the U.S. and about one of three people 60 years and older will suffer from the disease. HZ prevalence is significantly higher among Caucasian compared to African Americans and Hispanics and a large disparity persists among races on self-reported HZ and vaccination rates . Moreover, though physicians’ attitude toward the adult immunization schedule were generally favorable, physicians prioritize some vaccines over others . In a busy primary care practice, lower perceived priority of certain vaccines such as herpes zoster, could have negative implications for vaccination rates. The difficulty of getting the vaccines (ZVL) may be partly due to insurance coverage which is under the pharmaceutical benefit for Medicare Part D. Most of HZ vaccines are widely administered in venues such as the local pharmacies. Thus, access to the vaccine could be hindered where pharmacies do not exist . The emergence of RZV poses another problem with insurance coverage. Beginning April 2018, most insurance carriers including Medicaid will cover the cost of RZV, but people 65 years and older are encouraged to use the local pharmacies to obtain their immunization while the 50-64 years of age can receive their HZ vaccine from their provider, retail settings, and urgent care clinics. Post-herpetic neuralgia: The most common HZ complication is post-herpetic neuralgia (PHN), a chronic neuropathic pain that persists after 90 days from the onset of the initial site of the rash [35,36]. The severity of PHN increases in age and affects at least 10-13% of 60 years and older population . People afflicted with PHN can experience moderate to severe pain for months or years at the same site of the rash. The different characteristics of PHN pain, such as constant or intermittent burning, deep aching, shooting, and throbbing can be devastating to any elderly population [2,13]. The pain worsens at night or with temperature changes. This moderate to severe pain and discomfort, depending on the affected site, disturbs sleep, reduces physical, emotional, and social functioning; and interferes with ADLs. The magnitude of HZ-related physical interference with ADLs increases depending on pain severity. Unfortunately, the negative effect of PHN on ADLs and quality of life (QoL) can be overwhelming to any elderly individuals stricken with common age-related conditions. Herpes zoster ophthalmicus: When HZ has the potential to cause fifth cranial nerve lesions and affect vision, herpes zoster ophthalmicus results . HZ ophthalmicus accounts for 10% to 20% of all outbreaks . Appearance of a single or a cluster of vesicular rash on the tip or alongside the nose, also called Hutchinson sign requires immediate referral to the ophthalmologist. Potential loss of vision can result if treatment is delayed. Some of the prodromal manifestations of HZ ophthalmicus includes headache, pain in the affected eye, swelling of the eyelids, and malaise. Herpes zoster oticus (HZO): Also known as Ramsay Hunt syndrome, affects the facial and vestibulocochlear nerves. Clinical presentation includes facial paralysis on the affected side, ear pain, tinnitus, unilateral sensorineural hearing loss, and vertigo [2,13]. The loss of hearing can be a consequential outcome. Secondary skin infections: Open lesions on the skin can cause secondary bacterial infection from scaling or crusting lesions. The superinfection is usually caused by staphyloccous aureas. Redness, warmth, or purulent drainage surrounding the lesions can appear from improper treatment and irritation or scratching of lesions. Scarring on the skin after the crusting of lesions can potentially alter body image. The PHN, herpes zoster ophthalmicus, and herpes zoster oticus all affecting the sensory system can really render a person incapacitated from moderate to severe pain, to dizziness or to blindness and loss of hearing. On rare occasion, pneumonia, encephalitis, partial paralysis or weakness of the dermatomal distribution, or death can occur. The necessity of HZ vaccination among 60 years and older reduces the incidence of the complications of HZ. Immunocompromised individuals are more likely to have complications from herpes zoster. Zoster vaccine live: The CDC’s Advisory Committee on Immunization Practice (ACIP) recommended a single dose of Zostavax in 2006. The HZ vaccine was included in CDC’s recommended adult immunization schedule to all eligible adults regardless of a prior history of HZ . The recommended dose was based on a 51% reduction of HZ among adults 60 years and older who were vaccinated as reported on Shingles Prevention Study . Long-term effectiveness of HZ vaccine is not fully determined, hence the recommendation continues to be single dose of HZ vaccine. Further, FDA had approved the vaccine to be available for 50-59 years in 2011, however, ACIP declined to follow the FDA recommendation, citing the limited data on duration of protection . One research report by Tseng et al. revealed rapid decline of the effectiveness of the HZ vaccine, from 68.7% in the first year to 4.2% in the eighth year. The tolerability of the HZ vaccine, adverse effects, and protection up to three years was reported by Gagliardi et al. . Gigliardi and colleagues’ meta-analysis reviewed 13 randomized controlled trials (RCTs) or quasi-RCTs with a total of almost 70,000 subjects comparing herpes zoster vaccine with placebo or no vaccine. The objective was to evaluate the effectiveness and safety of vaccination for preventing herpes zoster in older adults (mean age greater than 60 years). The studies included only healthy Caucasian individuals 60 years and older without immunosuppressive comorbidities. The analysis indicated that the incidence of HZ was lower in participants who received the vaccine than in those who received a placebo: risk ratio (RR 0.49; 95% (CI), and RD 0.43 to 0.56. Morrison et al. studied general safety of Zostavax vaccine among adults 60 years and older with prior history of HZ, from the day of vaccination through 28 days of follow up for serious adverse events . The results showed no contraindication to receiving HZ vaccine even with documented prior history of HZ disease. Zoster vaccine recombinant, adjuvanted: Shingrix was recently recommended by the ACIP on October 25, 2017 for adults 50 years and older to prevent incidence of herpes zoster or shingles. Studies by the manufacturer demonstrated that the vaccine effectiveness is due to its ability to increase the varicella-zoster-virus (VZV) immune response . The vaccine is given in 2-dose series, with the second dose administered between month two and six after the initial dose. A randomized, placebo-controlled study conducted by Lal et al. reported vaccine efficacy between 96.6% to 97.9% for all age groups . In the fourth-year post-vaccination, vaccine efficacy among adults 50 years and older was 93.1% (95% confidence interval [CI]). A separate study by Cunningham et al. on persons 70 years and older revealed the efficacy of the vaccine was 89.8% (95% CI) and decreasing to 85.1% (95% CI) in the fourth year after vaccination . Shingrix is recommended for immunocompetent adults and for those people who had previously received zoster vaccine live (Zostavax). For future prevention of related complication of HZ, such as PHN, Shingrix is preferred over Zostavax. As with every vaccine injection, usual adverse reactions include pain at the injection site, redness and swelling. Other solicited general adverse reactions include myalgia, fatigue, headache, shivering, fever, and gastrointestinal symptoms . The general tolerability of Shingrix was demonstrated with the two doses administered intramuscularly within 7 days after the injection. At this time, Shingrix shows longer efficacy as compared to Zostavax. CDC’s Adult Immunization schedule table shows that Shingrix is preferred over Zostavax especially on immunocompromised individuals because Zostavax is a live attenuated vaccine. Shingrix is the preferred choice for 50 years and older, while Zostavax will remain to be available for use for the people 60 years and older. Barriers to herpes zoster vaccination: Several studies showed the risk for HZ can be reduced with HZ vaccination. However, Yang et al. found that the obstacles to vaccination can be attributed to low perceived risk of getting HZ and the high cost of the vaccine . The results indicated that expanding public education and physician recommendation were the most important factors leading to an increased HZ vaccination rate. Lee et al. suggested that the use of media has the greatest influence on patients who received the HZ vaccine . Other studies indicate that high awareness does not always lead to vaccination because of drug side effects, high cost, and lack of recommendation from physicians . However, even with increased physician’s efforts to improve vaccination rates, financial burden and reimbursement issues remain the major barriers [20,24]. Premiums for Medicare Part D coverage which includes the zoster vaccine live HZ vaccines are costly, especially for reduced income, retired adults . Hurley et al. 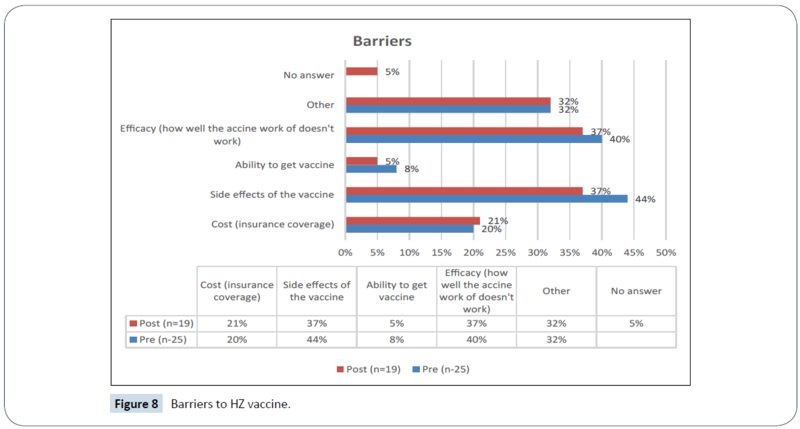 identified top three barriers to HZ vaccination were financial: cost to patients, reimbursement issues, and initial cost of purchasing the vaccine . Costs can be prohibitive based on the uncertainty or need for ZVL revaccination as one ages. Similarly, RZV (Shingrix) have differing costs among retail pharmacies and insurance coverage is expected to be determined in early April 2018. Global awareness and knowledge of HZ and racial disparities were additional barriers to vaccine awareness [11,44]. ZVL or Zostavax declining effectiveness could deter specified populations from receiving the HZ vaccine. This rapid decline of ZVL effectiveness is worrisome to affected populations who may likely question the long-term coverage of recombinant, adjuvanted Shingrix. Herpes zoster vaccination guidelines or recommendations: A clinical guideline published by the Infectious Disease Society of America (IDSA) (2013) bases its recommendations on strong quality of evidence and moderately strong recommendation for vaccination of family members of immunocompromised patients, while the use of the vaccine in immunocompromised patient reflected moderate quality of evidence and strong strength of recommendation . Specific guidelines include are listed with reference to the strength of the evidence and the importance of the recommendation included in parentheses. 1. Zoster (ZOS) should be given to patients aged 60 years and older if it can be administered greater than 4 weeks before beginning highly immunosuppressive therapy (strong, low). 2. ZOS should be considered for varicella-positive patients (i.e., persons with a history of varicella or zoster infection or who are varicella–zoster virus [VZV] seropositive with no previous doses of varicella [VAR]) aged 50–59 years if it can be administered greater than 4 weeks before beginning immunosuppressive therapy (weak, low). 3. ZOS should be administered to patients 60 years and older who are receiving therapy considered to induce a low level of immunosuppression (strong, low). 4. ZOS should not be administered to highly immunocompromised patients (strong, very low) (IDSA, 2013) . Although the ZVL was approved by FDA for adults 50-59 years old in 2011, ACIP maintained its position in 2013 to start ZVL HZ vaccination in 60 years and older population. The main reason for exclusion was because of the lack or limited evidence on duration of protection provided by the vaccine and limited availability of the ZVL at the time. The authors hypothesized that persons vaccinated prior to age 60, may lose immunity overtime and would not protected when HZ prevalence and its complications are at higher risk. At this present time there are no new guidelines from IDSA inclusive of RZV vaccine. 1. Two doses of RZV administered 2-6 months apart should be used among immunocompetent adults, 50 years and older. 2. Two doses of RZV administered 2-6 apart should be given to adults 50 years and older regardless of previous vaccination to ZVL (Zostavax). 3. The use of either RZV and ZVL vaccine for 60 years and older adults (RZV is preferred). Educational strategies: There are multiple research studies, both national and global, on awareness, prevalence or incidence, and vaccine effectiveness and tolerability but there is a lack of studies showing educational strategies that improve awareness and vaccination rates. An informational article by Reeves and Beuscher provided some suggestions on educational approaches on clinical management and recommendations on patient education . The website engine and media have been the main form of educational information on herpes zoster and the need for vaccination. Herpes zoster is a painful skin lesion that is prevalent among adults 50 years and older. The disease has been responsible for the development of post-herpetic neuralgia complication. All phases of the disease can make older adults incapacitated due to pain and affects activities of daily living and quality of life. Potential vision loss and hearing from herpes zoster ophthalmicus and hearing oticus can worsen an already decreased physical functionality of an elderly person. Recommendations for the vaccine and patient education can greatly impact vaccination rates. The tolerability and efficacy of both version of the vaccine has been well documented. The declining effectiveness of ZVL vaccine for immunocompetent and immunocompromised adults >60 years and older warranted ACIP to recommend the RZV (Shingrix) for its better coverage and effectiveness. To prevent confusion among the 50 years and older population, delineating each of the vaccine and its effectiveness may hope to improve their likelihood to receive either of the vaccine. Sufficient research about the efficacy and longevity of the vaccines in production has resulted in guidelines. However, there is a gap related to educational strategies to increase herpes zoster awareness and improve vaccination rates, especially since the emergence of the new vaccine. The goal of this project is to bridge the gap by implementing educational strategies to improve the outcome. The overall purpose of this project was to help increase vaccination rates. Two methods were used. First the Herpes Zoster Global Awareness Survey (HZGAS) tool was used with adults 60 years and older in a clinic setting. The HZGAS was modified for this study. The Herpes Zoster (Shingles) Pre and Post Survey (HZPPS) was used to assess the incidence of HZ and barriers to vaccination, distributed and collected by an interprofessional collaborative team, and provided evaluation outcomes at an urgent care clinic in Midwestern community. Additional objectives included collaborating with the clinic’s information technology (IT) to create a pop up in the EMR that prompts users to assess vaccination status, to use comprehensive educational strategies to increase vaccination rates, and to increase/establish vaccine availability in the urgent care through collaboration with pharmaceutical company. Surveys are a good method of obtaining information from any population and are flexible with regard to question type, number of questions, and method of distribution . For the clinic setting, a survey was chosen as a method to determine incidence rates and barriers to HZ vaccination among adult patients. Self-reported behaviors and beliefs are appropriate to obtain through surveys . While the use of a survey is a quick, economical way of gathering information, surveys rank low as a data collection method because self-reported data may not be honest or true. Responses are very subjective. The second component of this project included a presentation at a local senior center in the county vicinity. It was a one-time opportunity to implement the educational strategies to a large group instead of one-on-one implementation at the clinic. This has the potential to be repeated at another time with a different group. A five-survey question was distributed post presentation to gauge understanding and their likelihood of receiving the vaccine. The HZPPS was modified from the Herpes Zoster Global Awareness Survey created by Ogilvy PR and Research International, London, UK. The survey was available through literature review of an article by Paek and Johnson . The Health Belief Model (HBM) was the theoretical framework used to design the survey. Pre- and post-surveys based on the HBM were conducted using a HZPPS data collection tool on all patients 60 years and older until the 25th adult participated. The variables listed on the tool included age, gender, ethnicity, educational attainment, if diagnosed with HZ in the past, if relative or friends had HZ, describing the worst symptoms, barriers to HZ vaccination identified from the literature, and perceived risk on getting HZ disease. The survey used a Likert scale with headers of very likely, somewhat likely, unlikely, and very unlikely. Additional questions in the survey tool included two open-ended questions, about whether or not, receipt of shingles vaccine decrease the chances of getting HZ, and if participant would seek more information from a healthcare provider about a vaccine that could prevent occurrence of shingles or HZ. The HZPPS was included as part of the regular admission paperwork when patients were admitted to the clinic. At the urgent care clinic, adults 60 years and older were included in the convenience sampling of a total of 25 participants, including patients and their partners. Patients were asked to participate during the clinic intake process. On the other hand, there were 20 total participants at the educational implementation at the senior community center. The use of convenience sampling methodology limited the diversity of participants, both at the urgent care clinic and the senior community center. The participants may not have represented the regional, general population of adults 60 years and older. An interprofessional health care team, including other nurse practitioners, full or part-time medical assistants, and the administrative assistant were trained on the dissemination of the survey tool. Key stakeholders included the owner of the clinic, other NPs, a receptionist, medical assistants, and the patients themselves or significant others. Project success depended largely on the key stakeholders and their acceptance of the project, which had a substantial effect on the outcome. The urgent care clinic provided the venue for the data collection. The urgent care clinic used an electronic medical record (EMR) Codonix. One of the objectives is to create a pop-up reminder to identify patients 50 years and older to increase awareness, and prevention of HZ disease through immunization. Codonix IT representatives were amiable to the proposal, however, the proposal had to be cleared through the administration. GlaxoSmithKline representatives provided tear off brochures on patient education about shingles, including prescribing information, and reprinted articles on the effectiveness of RZV or Shingrix vaccine. These brochures were used in educational presentations both at the urgent care clinic and the local senior center. The urgent care clinic is located midway between Chicago, Illinois and Milwaukee, Wisconsin, in southeastern part of Kenosha, Wisconsin. The urgent care is independently owned and operated by a nurse practitioner with a collaborating physician. It is open Monday through Friday, 8 am–pm, and on Saturday, 10 am–3 pm. The clinic provides healthcare services to all age groups, ethnicity, gender and accepts most insurance plans. The senior community center promotes healthier lives for seniors through wellness/exercise activities, computer and craft classes, and camaraderie and support. Membership is not necessary to participate in activities. Open to all seniors who lives in the county. The community center is open everyday except on Sundays. Educational interventions were conducted at two sites. First, The Herpes Zoster (Shingles) Pre and Post Survey was conducted between January 17, 2018 and February 28, 2018. The pre-survey includes ten forced choice responses and two open-ended questions. The open-ended questions required spontaneous responses. For example, question eight (8) (Whether or not you know anyone who has shingles (herpes zoster), what symptoms was described as the worst?) the response was recorded and tabulated. Instead of coding which might be an open-ended question for #9 and #12, checking or marking all that apply would be an easier option for the participants. Questions 7, 9, and 12 are questions with dichotomous outcome variables (i.e. one or more answers must be selected). The pre-survey was either conducted by face-to-face interview or the participants were given the pre-survey questionnaire while waiting in lobby or while in exam rooms. These options depended upon the wait times and the availability of the exam rooms. The survey results were reviewed for completion and inclusion. Once the participants completed the survey and agreed to participate in the educational session, the investigator or another nurse practitioner provided information about herpes zoster (shingles) disease and vaccine. Educational strategies such brochures, PowerPoint presentations, and videos provided brief pathophysiology, incidence, risk, vaccines available, guidelines, and management or treatment of herpes zoster. The pre-and-post surveys were read to participants who had impaired or low vision. The post-survey was handed to each willing participant post educational strategies. All participants who completed the survey were categorized in respect to age, gender, level of education, and whether the participants have heard of herpes zoster or shingles. Participants who had experienced shingles proceeded to answer question #8 and the rest of pre-survey questions and could chose not to participate in educational session and the post-survey questions. A PowerPoint presentation was provided at the local senior center, with opportunities for the attendees to ask questions during or after the presentation. Attendance was voluntary. Most attendees visited the senior center just to hear about HZ or shingles. A five-item question was distributed to willing attendees to evaluate the presentation and their likelihood to get the vaccine (Figure 2). 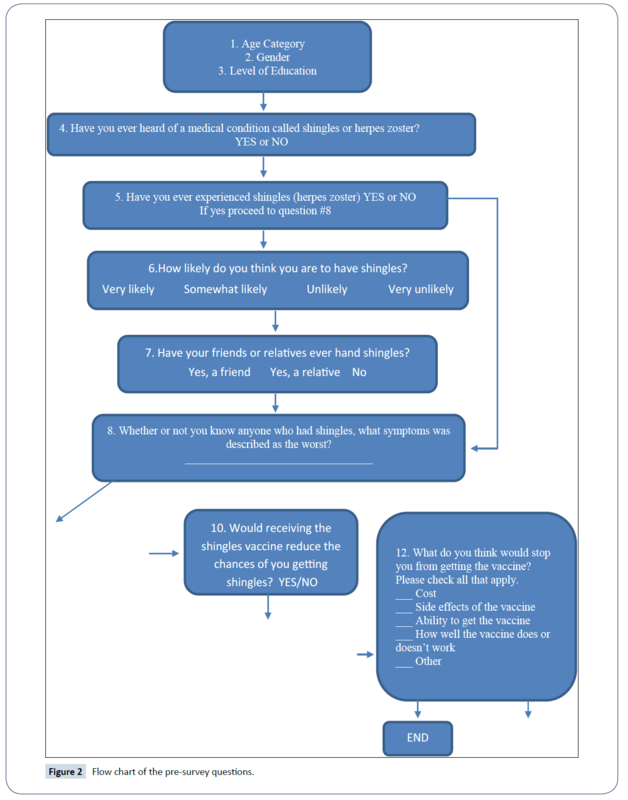 Figure 2: Flow chart of the pre-survey questions. The primary investigator collaborated with the interprofessional team to disseminate the survey tool at the clinic. The survey tool included a letter to each participant to consent to the pre-and-post survey. A comprehensive educational program for older adults and their partners or family members consisted of easy to read PowerPoint presentations, a pamphlet or brochure, and if feasible, a one-on-one question and answer segment after the presentation. The educational session included the relative risks or incidence rates of HZ, pathophysiology of the disease process, and risk factors for the development of HZ as well as the cost and insurance coverage. The tolerability and effectiveness of HZ vaccine in preventing PHN and other complications was the focal point of the educational objective at the sessions. Following approval from the IRB, an educational session was initiated at a local senior center on March 21, 2018. The community senior center is located in Kenosha County, the geographic area which is served by the urgent care clinic. Permission was received by the senior center director. To increase turn-out on the educational presentation, fliers and a printed 24 x 31 inches Poster advertised the event at the facility entrance. Pamphlets and tear-off brochures were provided by Merck and Company, and GlaxoSmithKline. A PowerPoint presentation was used for the presentation and included the name of the investigator, school affiliation, and purpose of the project. Likewise, a representative from the senior community center made an introductory remark about the investigator. Concurrent with the PowerPoint, complimentary shirts, pens, water bottle, and bags from the urgent care clinic was provided to the attendees. The investigator evaluated the effectiveness of the educational strategies through a post questionnaire survey. Monetary resources were not required for the generation and implementation of the educational sessions including the PowerPoint/poster presentation and pamphlets or brochures. The pamphlets and brochures were provided free of charge by the pharmaceutical company. The researcher received no personal compensation from the company. The investigator also collaborated with GlaxoSmithKline Biologicals to determine feasibility of vaccine supply at the clinic and unlike Zostavax which is a live attenuated vaccine, maintenance of vaccine viability requires constant regulation and monitoring of the refrigerator temperature. A designated regular refrigerator can be used for Shingrix products. The practice project was approved through the Institutional Review Board (IRB) at Southern Illinois University Edwardsville. An exempt research application was obtained. No participant identifiers were collected. Numerical codes were affixed on the upper right-hand corner of the pre- and post-survey forms but not recorded or linked to the participants. Prior to conducting the survey, this investigator completed CITI Human subjects Research training. The participants varied markedly according to age category from 60-69 years old category (n=18, 72%), 70-79 (n=6, 24%), to 80-89 (n=1, 4%). For all the age categories, the majority of the participants were female (n=20, 80%) and male (n=5, 20%) (Figure 3). 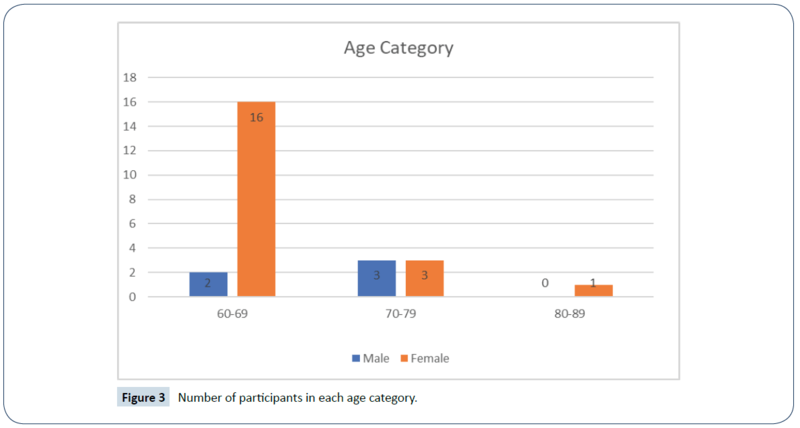 Figure 3: Number of participants in each age category. Almost three-fourths (72%) of participants were in the 60-69 years old category. The majority of the participants were female (80%) and one-fifth were male (20%). Nearly three-fourths were identified as Caucasian (72%). 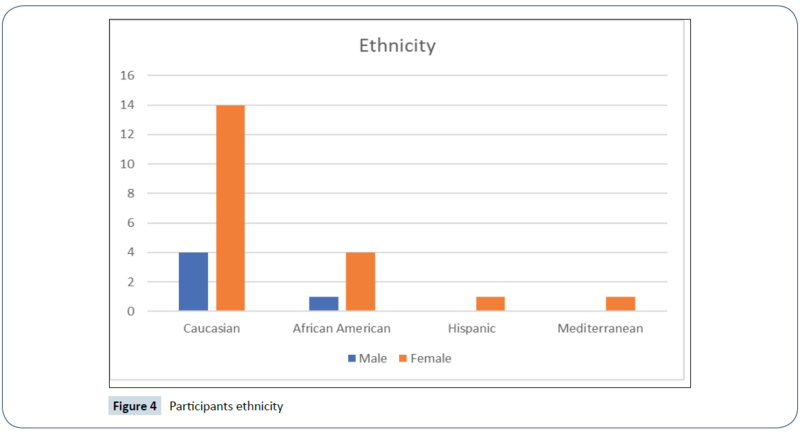 Of the minority groups, 20% identified as African-American, with 4% combined Hispanic and Mediterranean (Figure 4). Further breakdown of race category by gender reported that more than half of female were Caucasian (56%), and African-American (16%). 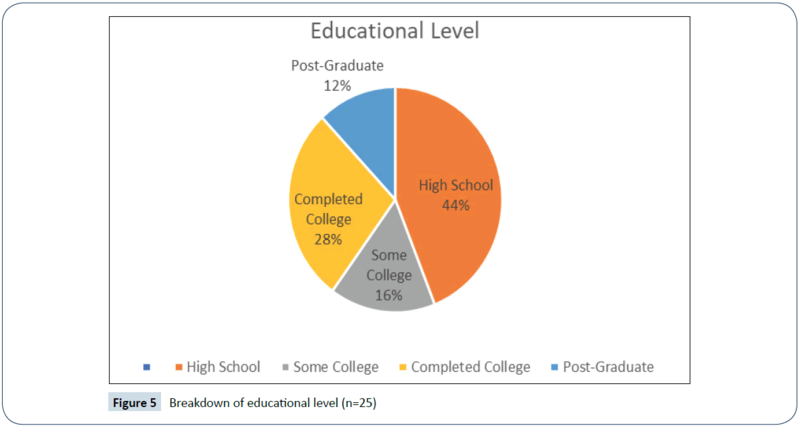 Most participants reported their educational level as having completed high school (44%), followed by completed college (28%), some college (16%), and post-graduate (12%) (Figure 5). Notably, four out five males finished high school, and one finished some college. In regard to the female participants, seven out of twenty completed high school, seven completed college, three finished some college, and three with a post-graduate degree. Overall, over half of the participants (56%) were educated beyond high school. Interestingly, all of the participants (n=25) have heard of shingles or herpes zoster. Of the participants, 72% had not experienced HZ. Among this group, of thirteen females and four males, almost one-third (31%) of the females had received the HZ vaccine, while the majority (61%) had not been vaccinated. A more notable finding is that no male participants had been vaccinated. Additionally, of the seven females who experienced shingles or HZ, three received the Zostavax vaccine after HZ disease but four reportedly received no HZ vaccine (Table 1). Table 1: Male and female comparison of awareness, personal and friends or relative experience of HZ. Most participants (n=18) in the pre-survey who had not experienced HZ believed that they were unlikely or very unlikely (61%) to develop shingles or HZ in their lifetime. Almost all the male (80%) participants and over half of the female (54%) participants shared similar opinions of the likelihood of not succumbing to HZ. Even though most of the participants (83%) either had a relative, a friend, or both who had HZ or shingles, the participants were not persuaded that their risk was any greater. 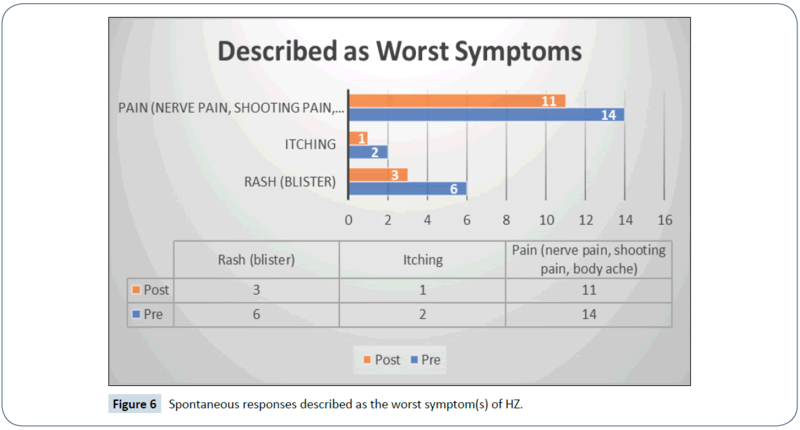 In both pre- and post- survey (Figure 5), most participants described pain as the worst symptom of HZ, followed by rash and itching. For participants who had experienced shingles or HZ first hand, the most common symptoms were pain (71%) and itching (29%). Moreover, participants who had not experienced shingles or HZ, cited pain (55%), rash or blisters (38%), and itching (11%) as the worst symptoms of HZ. The male participants identified rash as the worst, but their female counterpart identified pain as the worst symptoms of HZ (Figure 6). Figure 6: Spontaneous responses described as the worst symptom(s) of HZ. 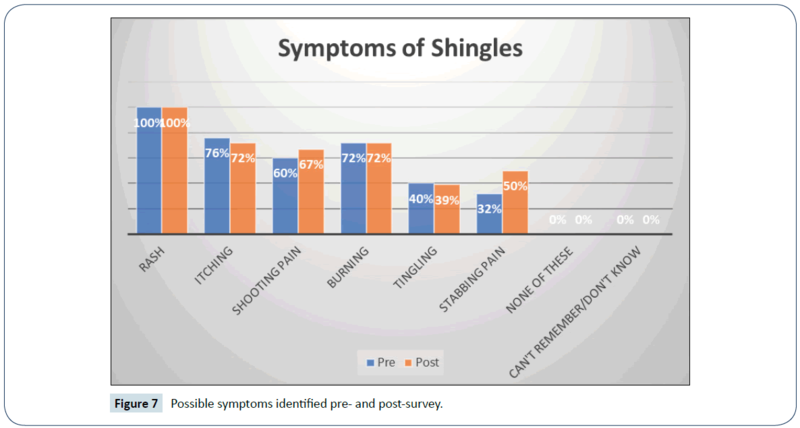 When participants marked the possible symptoms of shingles or HZ in the pre-survey, all cited rash (100%) as one of the symptoms, followed by itching (76%), burning pain (72%), shooting pain (60%), tingling (40%), and stabbing pain (32%). With pain being divided in different characteristics, such as shooting, burning, and stabbing, the symptoms were generally consistent among the female participants (Figure 7). Figure 7: Possible symptoms identified pre- and post-survey. Among female participants who responded that shingles vaccine would reduce the chances of getting shingles or HZ, 75% agreed on the pre-survey. However, in post-survey 60% of female participants responded that shingles vaccine would reduce their chances of developing shingles disease. A variety of circumstances likely impacted the female participant’s decision. One, there are two shingles vaccines available in the market, Zostavax and Shingrix. With the new change in the ACIP’s guideline, everyone who had received Zostavax was encouraged to receive Shingrix for better coverage. Three female participants (n=7) received Zostavax vaccine after personal experience with HZ. Four had opted not to get vaccinated post disease. Among those four, three expressed their likelihood to receive shingles vaccine as “very likely.” For the female participants who never experienced shingles (n=13), four had been vaccinated with Zostavax or Shingrix, and five of the eight responded “very likely and or somewhat likely” to receiving the shingles vaccine. Secondly, the declining efficacy of Zostavax presented during education, may have impacted their decision, in which one responded that the vaccine coverage is 50-50%. One female participant expressed her belief that vaccines can cause autoimmune disorders. In pre-survey (n=25), the majority of the participants (68%) responded that they would seek more information from their health care providers about a vaccine that could prevent shingles if one were available. However, seventy-seven percent (74%) of participants in post-survey responded that they will seek more information (Table 2). Table 2: Likert-scale responses to different survey questions. Of the nineteen participants who responded to likelihood of scheduling self to get shingles vaccine, the majority (63%) reported “very likely or somewhat likely” while 37% declared “unlikely or very unlikely.” None of the male participants agreed to schedule themselves to get the shingles vaccine, the female participants comprised of the majority. When participants were asked of their readiness to a schedule an appointment or the receive the shingles vaccine today–47% (not now), 21% (yes), 16% (anytime soon), and 16% (never). The 60 years and older participants perceived their level of susceptibility and threat of developing shingles or herpes zoster as high, but yet their readiness denotes otherwise. Of the 47% of participants (n=8), two had been recently vaccinated with Zostavax and two had experienced shingles. Figure 8: Barriers to HZ vaccine. The most significant barrier or facilitator to this project was the emergence of RZV and the resultant change of CDC’s guideline on HZ immunization. Evidence suggests that RZV is preferred over ZVL for adults 60 years and older. Participants who had previously received ZVL are now faced with the decision to receive another vaccine with promising coverage. The buy-in of RZV may be slow because older people are generally not a risk taker. Objective 2. Evaluation of the effectiveness of the educational strategies through the use of post-questionnaire survey or the acceptance or receipt of the HZ vaccine: The awareness of HZ disease was consistent among male and female participants, but the extent of their knowledge was not determined. Most of the female participants (65%) are educated beyond high school, with 35% of them completed college and 15% of them have either post graduate or completed some college. There was no relationship between educational level and decision to receive the vaccine. However, among the female participants (n=7) who experienced the disease, over half (57%) opted not to receive the vaccine. Among that group, 43% had completed college or post-graduate degree. The women voiced their assumption that after an initial episode of the HZ disease they were very unlikely to develop another episode. The pre and post survey also demonstrated that participants considered pain as the worst symptoms of HZ even with or without prior experience to HZ. Different characteristics of pain as a response was generally consistent among the participant who identified shooting pain, burning and stabbing pain, as the symptoms of HZ. However, symptoms of rash topped the list in pre- and post-survey followed by the symptoms of itching. This response raised awareness that acute pain and long-term complication of HZ which is post herpetic neuralgia should be emphasized and highlighted in educational implementation. Generally, the results of the survey post educational implementation were positive. The majority of female participants responded that their likelihood of getting HZ was very likely and somewhat likely but quite opposite to the male participants of unlikely to very unlikely. High percentage of participants agreed that HZ vaccine can reduce chances of developing HZ and are likely to seek more information from their health care provider about a vaccine that could prevent HZ if vaccines were available. Additional post-survey questions: Three additional questions only asked on post survey included: “How likely would you get the vaccine?” Majority of the participants (n=19) responded very likely to somewhat likely to getting the HZ vaccine. The educational implementation were perceived better by the female participants and again in contrast the male participants, they remained immovable with their decision and their response was not investigated further but would be of interest in future research. “What is the likelihood you would schedule yourself to get the shingles vaccine?” The educational implementation had greatly impacted majority of the participants’ response to schedule themselves to receive the HZ vaccine. Again, 63% responded very likely and somewhat likely. Persistence among health care provider to encourage the receipt HZ vaccine to prevent the painful rash and possible complication of PHN should be a priority. “Are you ready to have the shingles vaccine today or schedule an appointment?” Inquiring of the readiness of participants about receiving the vaccine today or scheduling an appointment – results suggest that timing is everything. Participants were surveyed in an urgent care where some presented with acute illness which hindered their ability to receive the HZ vaccine. Hence, almost half of the participants (47%) responded “not now.” The availability of the newer vaccine prompted 37% of the participants to respond with either “yes” and “anytime soon.” A few of these participants are awaiting insurance coverage after April 2018, when the recombinant zoster vaccine will be covered by most insurance plans. A couple of participants who had previously received the ZVL reported “not now” since their vaccine would likely cover them for the next 3-4 years. Post-educational survey at senior community center was conducted to evaluate the educational presentation. A total of 20 seniors excluding the staff attended the presentation. Fifteen individuals participated in the post-educational presentation survey. Included in the post-educational survey are #3 and #4 questions derived from the HZPPS. For example, question #3: Now, that you heard about shingles and the vaccine, how likely would you get the vaccine? Responses on this question used the Likert-scale. There were nine (60%) (n=15) who responded that they are “very likely” to receive the vaccine, three (20%) “somewhat likely,” two (13%) unlikely, and one (6%) “very unlikely.” Question #4: Are you ready to schedule an appointment with your health care provider to get the shingles vaccine? Six (40%) responded “yes,” three (20%) “anytime soon,” four (27%) “not now,” and one (6%) “never.” The educational presentation was well received, and individual questions were addressed. Over half of the individual attendees responded that they are more likely to receive the vaccine and their readiness in receiving the vaccine was either “yes” and “anytime soon.” This pilot educational presentation in the senior community center provided an excellent way to increase awareness and prevention of HZ disease. Objective 3. Integration of educational strategies into regular visits using written tools such as brochures or pamphlet: The findings of this survey provide a necessity of educational strategies by health care providers to increase vaccination rates among adults 60 years and older. The ACIP guidelines had changed to include the recombinant zoster vaccine (Shingrix) in preference over the zoster vaccine live (Zostavax) to be given to all adults 50 years and older regardless of receipt of vaccine or previous HZ history. As the age bracket widened including 50 years and older population, so thus, incorporating various hand-outs, brochures, and tear-out sheets to increase awareness of HZ disease, its relative risk, and possible complication became a priority. Epidemiological data for this county where the project was conducted in comparison to the rest of the state shows that the county is lagging behind with the percentage of adults vaccinated with HZ vaccine in years 2014 (19.73%), 2015 (19.60%), and 2016 (20.20%) by 10%. Likewise, the ratio between the county population and primary care providers (PCP) was 2,240:1 which is double the ratio for the rest of the state. The 60 years and older population would not likely get vaccinated if PCPs are not able to accommodate all of their patients during their regular office visits. The emergence of retail clinics and independent urgent cares staffed by nurse practitioners are means to increase vaccination rates, thus, incorporating quick and easy to read brochures coupled with health promotion and disease prevention recommendation will likely increase vaccination rates. Additional media (e.g. television) or posters and brochures about HZ in each exam rooms in the urgent care clinic would be beneficial as well. Patients would be exposed to accurate education about the HZ disease and potential for prevention through vaccination. Objective 4. Collaboration with clinic owner and glaxosmithkline (gsk) biologicals, to determine feasibility of providing recombinant zoster vaccine (shingrix) supply for the clinic: Multiple conversations with the clinic owner and GSK representatives had transpired over a course of two months to supply the clinic with recombinant zoster vaccine (Shingrix) feasible-since it only requires a regular refrigerator. This was accomplished on April 4, 2018 through a conversation with the clinic owner who agreed to supply the urgent care clinic with Shingrix. The office manager is looking into either purchasing it directly through GSK or through a 3rd party such as McKesson. One part of the feasibility of stocking Shingrix vaccine is the insurance coverage. Newer vaccines are generally expensive. There’s no definite answer for when most private or public insurances, including Medicaid, would cover cost at 100%, however, Medicare Part D does cover for people over the age of 65. The urgent care will stock at least two vaccines for now, until insurance companies decide on coverage. Objective 5. Collaboration with information technology (IT) department to create a pop up reminder or integrate a checkbox in electronic medical record (EMR): The intent of this objective is to have Codonix EMR to create a pop-up reminder in chart for healthcare providers to determine age eligibility of vaccine recipients. Codonix EMR have a check box in place for ZVL and RZV but nothing is available to delineate between childhood and adult immunizations. The feasibility of this objective is still to be determined. The primary limitations to research project resulted from using the HZPPS and the setting were the research was conducted. As with any survey, the result may be impacted by response bias, in an essence that participants might have desired to please their health care provider. Patients presenting in these settings have one goal in mind, to be seen as quickly as possible. Any additional wait time can significantly impact the results of the survey. Although, there were only 24% who had not completed the post-survey and opted not to listen to the educational strategies, three of those participants (n=6) who either but had prior HZ diseases with receipt of shingles vaccine, or no prior history of HZ but received vaccination. The time of day (e.g. near the participant’s lunch time and closing time) were often times of an influx of patients. This resulted in longer wait times and impacted each participant’s ability to participate in educational strategies and completion of post-survey. A total of 20 to 30 minutes additional time (from their wait time) is necessary to complete the whole survey process. A few of the participants elected not to continue. Despite efforts to obtain diverse representation by ethnicity and gender, convenience sampling was a concern. Majority of the participants were Caucasian and female. The original Herpes Zoster Global Awareness Survey was conducted in different countries, thus, ethnicity was not implicated. Unfortunately, the HZPPS neglected to include ethnicity, however, during the interview process ethnicity was apparent to researcher, therefore it was noted on the survey questionnaire. Additionally, age was not evenly sampled, as 60 to 69 year-olds were overrepresented and 70 to 79 as well as 80 to 89 year-olds were underrepresented. The research project was limited to 25 participants and due to its voluntary participation, some participants opted not to participate in educational strategies or complete the post-survey. The collection of data was limited to when the IRB was approved, and the survey commenced from January 17, 2018 to February 28, 2018. The limited period proved to be challenging. Likewise, the influenza season was at its peak and patients, including prospective participants preferred not to linger longer in the crowded lobby of the urgent care. The timeline also impacted participants’ response to receiving the HZ vaccine due to presentation of their current illnesses, including, cough, pneumonia, sinus infections, asthma exacerbations, colds and flu-like symptoms. One of the participants was completing the survey while on nebulization treatment. The survey did not assess the age at which the participants had personally experienced shingles or herpes zoster or when they received the vaccine. Neither did the survey assess whether personal experience of HZ was initial or recurrence. Since the participant’s age must be 60 years and older and aligned to the older ACIP’s guidelines of adult immunization, participants were encouraged to get vaccinated with Zostavax starting at age 60. However, the efficacy of the initial vaccine waned overtime, and some participants had recurrence of HZ at least 1-2 times. With this recurrence, participants are apprehensive about the revaccination. During the initial undertaking of this project, there was only one vaccine available in the market, the zoster virus live (ZVL) or Zostavax. The new recommendation of the use of Shingrix vaccine for prevention of herpes zoster for adults 50 years and older took centerstage and created confusion on the 60 years and older population, especially for some who already received Zostavax. A part of the confusion was insurance coverage. Until the issue of insurance coverage resolves, most of the 60 years and older population are hesitant to receive the shingles vaccine. Even with increased awareness of herpes zoster or shingles in this Midwest region, the findings suggest that gaps still exist on the likelihood of 60 years and older contracting the HZ disease and if HZ vaccine can reduce its chances. However, the findings from the survey support the need to educate the 60 years and older population about the importance of managing herpes zoster through immunization. While the waning efficacy of the initial vaccine (Zostavax) had been a deterrent for the 60 years and older population, educating them of the promising higher (in years) effectiveness of Shingrix, elicited increased likelihood of getting and scheduling to receive the vaccine. Increasing education in primary care offices or urgent care settings about susceptibility, seriousness of herpes zoster and potential consequences of pos-therpetic neuralgia, and the benefits of receiving the vaccine would reduce the devastating effect of herpes zoster. While variations in delivery of education may exist due to limited time spent with each patient, the most important action is increasing awareness. The findings from this survey suggest that implementation of planned, consistent educational strategies would be necessary to increase awareness of HZ disease, its risks and potential complications, and the availability of two vaccines. These educational strategies should be practiced in settings such as office clinics where primary prevention is conducted. Unlike at urgent care settings, patients are recommended to participate in annual physicals, screenings, quarterly blood tests, and medication levels in a regular physician’s office, thus, nurse practitioner and other health care providers are best suited to encourage the intake of HZ vaccine in primary care settings. The introduction of the new recombinant zoster vaccine or Shingrix brought promising results in regard to effectiveness. However, further research should be undertaken to monitor efficacy of RZV or Shingrix after years of published research. Several research studies showing the waning efficacy of Zostavax, but to have successful vaccine initiative, recombinant zoster vaccine or Shingrix must demonstrate either longer or lifetime coverage. The survey should be replicated in a much larger population, inclusive of gender and ethnicity. Aligning research with recent guidelines change, patients 50 years and older should be included for better representation of the older population. If the same survey tool is used, some recommendations that needs to be incorporated would be ethnicity data, the initial episode of HZ, and if HZ disease developed prior to vaccination or vice versa. As with any educational strategies, timing would increase readiness – if participants are acutely ill, it is customary to defer any type of immunization at a later date but there should be some form of follow-up. Setting such as senior centers are great place to do educational presentation to increase awareness of HZ disease, pathophysiology, potential complications, relative risk, treatments, vaccine availability, and insurance coverage. Reeves G, Beuscher L (2015) Herpes zoster in older adults: An educational approach. J Nurse Pract 11: 538-543. Lal H, Cunningham AL, Godeaux O, Chlibek R, Diez-Domingo J, et al. (2015) Efficacy of an adjuvanted herpes zoster subunit vaccine in older adults. N Engl J Med 372: 2087-2096. Johnson BH, Palmer L, Gatwood J, Lenhart G, Kawai K, et al. (2016) Healthcare resource utilization and costs associated with herpes zoster in the US. J Med Econ 19: 928-935. Cunningham AL, Lal H, Kovac M, Chlibek R, Hwang SJ, et al. (2016) Efficacy of the herpes zoster subunit vaccine in adults 70 years of age or older. N Engl J Med 375: 1019-1032. Gater A, Abetz-Webb L, Carroll S, Mannan A, Serpell M, et al. (2014) Burden of herpes zoster in the UK: Findings from the zoster quality of life (ZQOL) study. BMC Infect Dis 14: 402. Coplan PM, Schmader K, Nikas, A, Chan ISF, Choo P, et al. (2004) Development of a measure of the burden of pain due to herpes zoster and post herpetic neuralgia for prevention trials: Adaptation of the brief pain inventory. J Pain 5: 344-356. Williams BA, Chang A, Ahalt C, Chen H, Conant R, et al. (2014) Current diagnosis & treatment: Geriatrics (2nd edition). United States: McGraw-Hill Education. Roh NK, Park YM, Kang H, Choi GS, Kim BJ, et al. (2015) Awareness, knowledge, and vaccine acceptability of herpes zoster in Korea: A multicentre survey of 607 patients. Ann Dermatol 27: 531-538. Lee TJ, Hayes S, Cummings DM, Cao Q, Carpenter K, et al. (2013) Herpes zoster knowledge, prevalence and vaccination rate by race. J Am Board Fam Pract 26: 45-51. Yang TU, Cheong HJ, Song JY, Noh JY, Kim WJ, et al. (2015) Survey on public awareness, attitudes and barriers for herpes zoster vaccination in South Korea. Human Vaccines & Immunotherapeutic 11: 719-726. Dunphy LM, Winland-Brown, Porter BO, Thomas DJ (2015) Primary care: The art and science of advanced practice nursing (4th edition). Philadelphia, PA: FA Davis Company. Papadakis MA, McPhee SJ (2016) Current medical diagnosis & treatment (55th edition). United States: McGraw-Hill Education. Ansaldi F, Trucchi C, Alicino C, Paganino C, Orsi A, et al. (2016) Real-world effectiveness and safety of a live-attenuated herpes zoster vaccine: A comprehensive review. Adv Ther 33: 1094-1104. Paek E, Johnson R (2010) Public awareness and knowledge of herpes zoster: Results of a global survey. Gerontology 56: 20-31. Lu P, Eulera GL, Jumaan AO, Harpaz R (2008) Herpes zoster vaccination among adults aged 60 years or older in the United States, 2007: Uptake of the first new vaccine to target seniors. Vaccine 27: 882-887. Williams WW, Lu P, O’Halloran A, Bridges CB, Kim DK, et al. (2015) Vaccination coverage among adults, excluding influenza vaccination – United States, 2013. MMWR Morb Mortal Wkly Rep 64: 95-102. Hurley L, Lindley MC, Harpaz R, Stokley S, Daley MF, et al. (2010) Barriers to the use of herpes zoster vaccine. Ann Intern Med 152: 555-560. GoodRx.com (2016) Zostavax: Zoster vaccine. Gagliardi AMZ, Andriolo BNG, Torloni MR, Soares BGO (2012) Vaccines for preventing herpes zoster in older adults. Cochrane Database Syst Rev. Schmader KE, Johnson GR, Saddier P, Ciarleglio M, Wang WWB, et al. (2010) Effect of a zoster vaccine on herpes zoster-related interference with functional status and health related quality-of-life measures in older adults. J Am Geriatr Soc 58: 1634-1641. GlaxoSmithKline Biologicals (GSK) (2017) Shingrix (Zoster vaccine recombinant, adjuvanted) Prescribing Information. Gerend MA, Shepherd JE (2012) Predicting human papillomavirus vaccine uptake in young adult women: Comparing the health belief model and theory of planned behaviour. Ann Behav Med 44: 171-180. Poss JE (2001) Developing a new model for cross-cultural research: Synthesizing the Health Belief Model and the Theory of Reasoned Action. ANS Adv Nurs Sci 23: 1-15. Centers for Disease Control and Prevention (2018) Advisory Committee on Immunization Practices recommended immunization schedule for adults aged 19 years or Older – United States, 2018. MMWR Morb Mortal Wkly Rep 67: 158-160. Alicino C, Trucchi C, Paganino C, Barberis I, Boccalini S, et al. (2017) Incidence of herpes zoster and post-herpetic neuralgia in Italy: Results from a 3 years population-based study. Hum Vaccin Immunother 13: 399-404. Morrison VA, Oxman MN, Levin MJ, Schmader KE, Gustelli JC, et al. (2013) Safety of zoster vaccine in elderly adults following documented herpes zoster. J Infect Dis 208: 559-563. Tseng HF, Harpaz R, Luo Y, Hales CM, Sy LS, et al. (2016) Declining effectiveness of herpes zoster vaccine in adults aged ≥60 years. J Infect Dis 16: 1872-1875. Hales CM, Harpaz R, Ortega-Sanchez I, Bialek SR (2014) Update on recommendations for use of herpes zoster vaccine. MMWR Morb Mortal Wkly Rep 63: 729-731. Gagliardi AMZ, Andriolo BNG, Torloni MR, Soares BGO (2016) Vaccines for preventing herpes zoster in older adults. Cochrane Database Syst Rev. Keough V, Tanabe P (2011) Survey research: An effective design for conducting nursing research. J Nurs Regul 1: 37-42. Neuman WL (2003) Social research methods: Qualitative and quantitative approaches (5th ed.) Boston, MA: Pearson.